Studio Carry On Harry , Singapore invited Leonard Perlmutter on its show all the way from NY via a phone conversation to share his teachings and empower audince with concept of meditation and yoga. Leonard Perlmutter is the founder and director of The American Meditation Institute in Averill Park, New York. Leonard also serves as the author and editor of “Transformation,” the Journal of Meditation as Mind/Body Medicine. 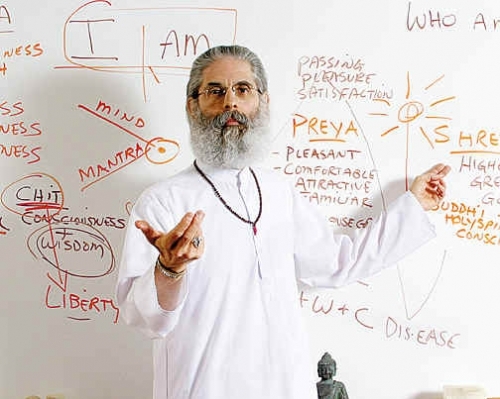 Over the past thirty-nine years, Leonard has served on thefaculties of the New England Institute of Ayurvedic Medicine in Boston, Massachusetts and the International Himalayan Yoga Teachers Association in Calgary, Canada. He has studied in Rishikesh, India and is a direct disciple of Swami Rama of the Himalayas––the man who, in laboratory conditions at the Menninger Institute, demonstrated that blood pressure, heart rate and the autonomic nervous system can be voluntarily controlled. These research demonstrations have been one of the major cornerstones of the mind/body movement.Mr. Perlmutter has presented informative workshops on the benefits of meditation and Yoga Science at the M.D. Anderson Cancer Center, The Albany Medical College,The New York Times forum on Yoga Science, the Commonwealth Club of California, the University of Wisconsin School of Nursing, the Washington University Medical School, the University of Colorado Medical School and the West Point Association of Graduates. Since 2009, Leonard’s Heart and Science of Yoga® empowering self-care program has been certified for continuing medical education credits by the American Medical Association and the American Nurses Association for continuing medical education credit. In 2014, Leonard’s 5 1/2 hour online video course, Comprehensive Meditation and Easy-Gentle Yoga, was released. It contains the core Heart and Science of Yoga® curriculum. Leonard lives and teaches in Averill Park, New York. His new Book The Heart and Science of Yoga: The American Meditation Institute’s Empowering Self-Care Program for a Happy, Healthy, Joyful Life shows us the way to meld meditation and yoga into your busy life experience to bring a new level of peace, contentment and wellbeing. While most North Americans today perceive Yoga as a valuable source of exercise and quieting of the mind, The Heart and Science of Yoga shows that it is so much more. As it was evolved through ancient wisdom, Yoga Science is an eight-step method for managing the life force energy that propels us and connects us to the infinite power that is within and without us all. And the result of mastering it is the bliss and daily joy that lies in the realization of our connection. This ultimate guidebook to meditation and Yoga Science explains not just what to do BUT WHY TO DO IT --- how our choices and actions energetically enhance or diminish our empowerment....influencing our ability to live well, peacefully and successfully. One of the most fascinating revelations of Leonard Perlmutter's The Heart and Science of Yoga, is that when you intentionally turn away from unhealthy temptations toward a better choice, it's not a sacrifice or a denial. It is actually transforming your energy into greater potency, will power, physical vitality and unlimited creative potential. Perlmutter's comprehensive and practical manual, first published in 2005 to great acclaim, and now revised and expanded, connects the dots for those who seek answers and solutions for finding a better, happier life through meditation and Yoga Science. The Heart and Science of Yoga is a master class. And meditation is the gateway. Perlmutter's great sense of humor and down-to-earth approach is appealing and approachable. Filled with anecdotes, parables, gentle loving encouragement and surprises, The Heart and Science of Yoga is both an eye-opener and a companion. It's the ultimate ladder to achieving mastery over your inner and outer worlds-and living in a daily state of transcendence. This 560-page easy-to-grasp guide provides everything you need to know to live the peaceful, contented, heart-driven Yoga Lifestyle in a modern world.